Based on the last ten years data for this location this page gives daily averages and general conditions for the month of August. Of course these are just averages - it's worth reading carefully to understand exactly what they mean and to recognise the kind of variation you could expect on a trip. These graphs show the maximum, minimum and average swell recorded on each day of the month over the last ten years. So the red part of the graph is the largest swell recorded on that day over ten years, the blue the smallest and the green bit is the average of all data on that day. 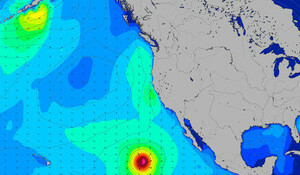 This gives some idea of the range of possible swells and the variation over the month. This graph shows the percentage of time in the month the swell would be rated at each increment in our 'star rating' system. This system is described in our help section but relys largely on period as an indicator of quality swell, taking into account the height also. This graph shows the percentage of time the wind blows from each direction on the compass in the month. It gives slightly more detail than the dominant wind and an idea of the variation possible. This is based on data collected every three hours, so an even spread from north to south could be half the days in each direction OR a morning offshore and afternoon onshore in some locations. This graph shows the percentage of time the wind blows at what strength in miles per hour, using the same disclaimer as above it gives an idea of the variability of local conditions and what might be expected on the 'average' day. 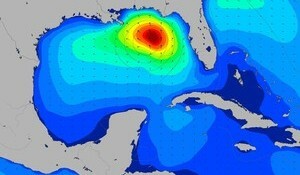 These swell averages are calculated ONLY on swells of more than eight seconds period. 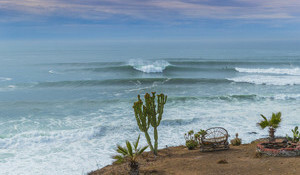 This means this is the average height of a swell that's likely to produce ridable surf NOT an average of every wave heading toward the beach in a month. We show the day by day breakdown out of interest, not because you could statistically expect the '12th' to be regularly bigger than the '19th' in any given month. 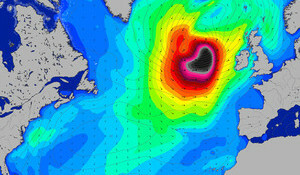 Even over a ten year period one huge swell will distort this slightly. What it does do is give an idea of the kind of variation that could be expected over the month.